Garner the enhancing fall colors along Watarase Valley! This is a one-day bus tour departing from Shinjuku. 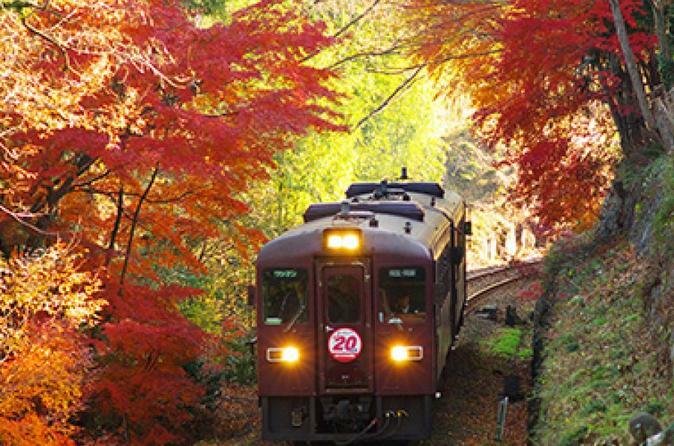 Upon arrival in Gunma Prefecture, we will take the local Watarase Keikoku Railway to appreciate the autumn leaves that adds glamorous tints to the rich nature here. Another spot to view foliage will be Takatsudokyo. In this trip, there is also the chance to watch one of Japan’s top three illuminations in Tochigi Prefecture. In Ashikaga Flower Park, the fascinating lights allure people into a dream-like wonderland. Lunch is included. Audio guide information will be broadcast in the bus. We depart at 8:50 AM from Shinjuku Station West Exit and head towards Gunma Prefecture. Gunma is well known for its various natural scenes, such as Mt. Akagi which is one of Japan’s top 100 mountains. It will be lunch time upon getting to Gunma, and please enjoy savoring the fresh local cuisine cucumber udon noodle and cutlet with dipping sauce. Menu for vegetarian can be provided upon early notice. Then we will take Watarase Keikoku Railway between Godo and Mizunuma Station. The staggering landscape along Watarase River can be viewed; vibrant greenery in spring and foliage in autumn are the signature scenes here gaining popularity. Other sightseeing or hot spring facilities also scatter along the railway. Afterwards we will take the 500 meters’ long promenade along Watarase River and stroll around Takatsudokyo for its breathtaking view of foliage. Last stop will be Ashikaga Flower Park. There is held eastern Japan’s largest scale illumination with 4 million light bulbs. The light up is showed around the concept of “Light Flower Garden”; illuminated images of wisteria, rose and lotus are very eye-catching. One of the exceptional lighting decoration works modeled after “Great Miracle Wisteria” is definitely a can’t- miss scene. This tour will be finished up around 8:00 PM upon arrival back in Shinjuku.